This 54 mile multi-use trail provides year-round outdoor opportunities including bicycling, hiking, snowmobiling & in line skating. Remarks by Garrison Keillor, September 30, 1998, Trails Dedication "I don't know how I am going to carry this plaque on my bicycle, for I did not bring a nap sack. I have come to Albany by bicycle, and I do not have a bicycle lock. I hope that is not going to be a problem. Congratulations to all of the people, the Jaycees, members of the County Board, Mayors, and township officials all up and down the line who have worked so hard to accomplish this beautiful trail. I have only seen about six and a half miles of it; but I saw it on a bicycle that has no low gear, and a bicycle that has a flat tire, and riding into a northwesterly wind. So, I feel that I have paid the price for the little bit of it that I have seen. It's an auspicious occasion to open up this new slower link between Avon and Albany and to include the other towns along the line - Freeport and Melrose and Sauk Centre and St Joseph; and I guess eventually, if they can raise the money, St Cloud. We need slow means of communication as well as rapid ones, you could get from Albany to Avon by freeway of course if you had to, but you would get there too fast and you wouldn't meet anybody along the way, you'd hope not to anyway. As I have bicycled six and a half miles from Avon and I have just in the course of that time, peddling hard, into a northwesterly wind on a flat tire, I have met a man whose great grandfather's wife's brother was the first man to teach a course at St. John's University when it was opened in November of 1855. He has another ancestor, his great great grandfather as a matter of fact, who was a deserter on the union side in the civil war. So, he has this great honor and this great blight in his family history. These are the sorts of things that people will tell you if they sit next to you in a tavern, or, they will tell it to you on a bike trail. I think it is interesting to have a great great grandfather who was a deserter and to realize that, for many of us, the fact is we would not exist had it not been for a lack of principle on our ancestors' part. These bike trails are absolutely popular and people love them once they're completed and once people get on their bikes and go ride them. But of course, in the public hearing stage that is a different matter. People come out and oppose them ferociously, as we all know. 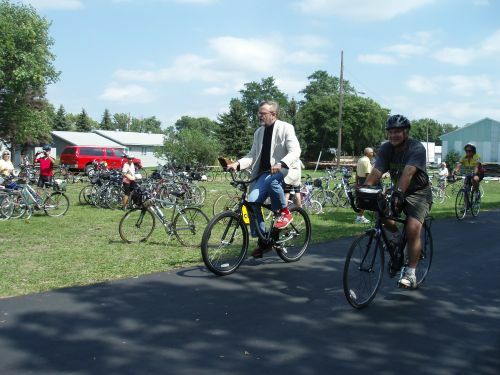 People are afraid of bicycle trails mainly because statistics show that there is a preponderance of college educated liberals who ride bicycles and they are afraid of bringing these people out into rural Minnesota and the effect that it may have on everybody. You may get a lot of Unitarians up here in Stearns County and not know how to deal with them. People who believe that Moses came down from the Mount with the stone tablet upon which god had given him the ten suggestions, people who send vigilantes out into Catholic communities and burn question marks on people's front lawns. But, we liberals are valued members of society so long as we stay in the minority, and we liberals have ways of remaining in the minority when we threaten to become a majority. This is a great asset to you and I hope that you all enjoy it. The people of Lake Wobegon are honored, in a way, to have you use their name. They do want it understood they are not responsible for any of the expenses or any of the liabilities, and they don't want it assumed that they are in favor of bicycle trails. But, in principle, they are for it so long as they are not connected to it. I was glad to give permission for the use of the name Lake Wobegon because the name really does belong to the people of this area. I chose Central Minnesota as the site of Lake Wobegon because I was writing fiction, and I wanted to choose a part of Minnesota that nobody ever went to so that I could say whatever I wanted to about it. So I think that for what you've had to put up with from me over the years, you ought to be able to use the name anytime that you want to. A couple of months ago National Geographic magazine asked me if I would write an article for them about Stearns County, and I said of course I would be happy to. The National Geographic, to my knowledge, never asked anybody to write about a work of fictional geography before, and they were interested to know about the part of the country that Lake Wobegon comes from. So, in some fashion, I will have to try now to start to write the truth about you, if that's what you want, I'm not sure. Well, I wish you many, many years of pleasure on this beautiful trail. Life gets hard sometimes, even in a place as beautiful as this, and on a day as beautiful as this, and a month as gorgeous as October is. Life can be confusing, and be depressing. It can be boring. People are desperate at times, and whatever you do, there is a number of different things you can do about it, and one thing is to get on a bicycle and head off on the trail, and a lot of answers will come to you in the course of just the six miles between here and Avon; more than you might ever want. No matter how depressed or confused or desperate we may be at different times, the world always offers itself to our imaginations when we take the trouble to go out and to look at it and to listen to it. I hope that you get great pleasure from seeing the world from this trail, thank you." Lake Wobegon Trail Covered Bridge. Photo by Chuck Wocken. Volunteer Army Reservists attach brackets on bridge. Photo by Chuck Wocken.